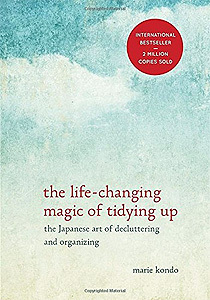 Like many people, I’m working my way through “The Life-Changing Magic of Tidying Up…” by Marie Kondo, also called the “KonMari” process. It’s about decluttering, and surrounding yourself only with things that bring you joy. The process has been astonishing, and I’m still early in the process. The following is this morning’s observation, which I shared elsewhere (in social media), but… well, you may enjoy this, too. Clearing out, I keep stumbling onto things I’ll like but I know I’ll never use. Or, the reason I bought it…? Now, it’s LIGHT YEARS off my current and projected creative trajectory. But, I’ll be honest. Letting go of the item is, on a small scale, kinda-sorta like a divorce. The breakup itself can be difficult (or not), but the REALLY excruciating part is: letting go of the original dream. You know… that “ooh, shiny” moment when I acquired whatever-it-is. The idea that it would be the coolest thing EVER, when I used it for… something. Often, that was some specific event or project that was part of an even larger, future vision. And then, my life swerved in a different direction. A direction that made more sense and turned out pretty darned cool, and I do NOT regret it. But each new adventure on that path took me even further from the earlier vision. So, a lot of the stuff I’m letting go of now… it was part of a rosy, “what if..?” dream. But that’s in the past. Often, the swerve in my life happened for an external reason. It’s WAY too easy to blame it on someone who really DID stand as an obstacle in my path, at that point. And he or she really WAS a jerk. But, jerk or not, my life went in a different direction. And I had fun anyway. Probably a LOT more fun than I might have had, on the previous path. Still, some of this process is like a divorce. And it’s FAR to easy to want to hold onto that old dream (and that related, old grudge)… IF I let myself do that. The process isn’t easy, but it’s healthy. And, by releasing those mini-anchors to the past, I’m allowing myself to move forward with less holding me back. For me, THAT’s what this is about. So glad to hear from you. I will check out this book.